Our old wrestling room is no longer. 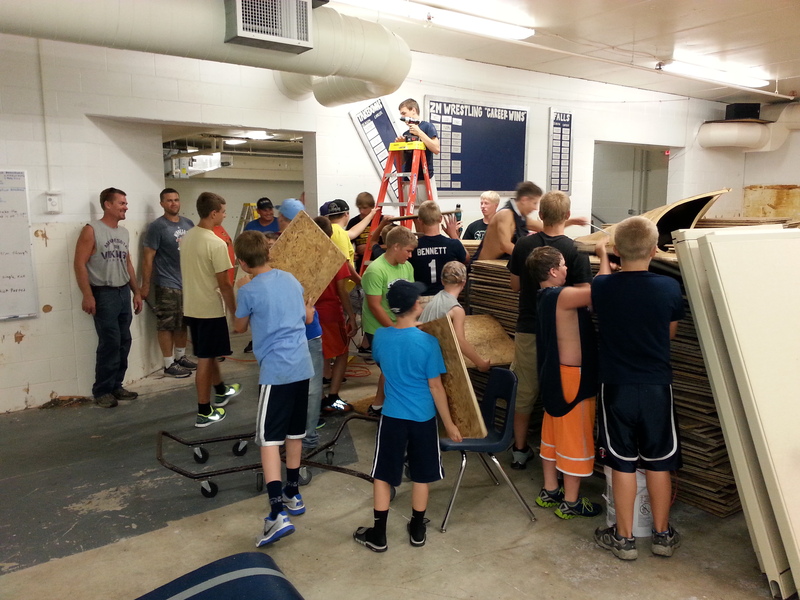 With the help of many, we stripped the old wrestling room down to bare walls, ceiling, and floor. It is all ready for movement to new wrestling room! Connor Heitman, Spencer DeFrange, Hayden Stensland, Hayden Voxland, Zach Stansrud, Freedom Hunt, Caden Steffen, Cody Heitman, Chase Steffen, Wyatt Freiheit, Joey Majerus, Hunter Prodzinski, Evan Block, Tyler Soltau, Jacob Bennett, Jarret Haglund, Isaiah O’Reilly, Luke Krier, Mike Majerus, and Jack Haglund. Parents Brian Majerus, Dan Bennett, Rob Haglund, Erik Bengtson, Shannon O’Reilly, and Steve DeFrange. As a wrestling coaching staff we are very fortunate to coach in the community we do! You guys logged roughly 80 hours of volunteer time last evening!